The Bell Helicopter tiltrotor, ducted fan hybrid aircraft had a giant crowd when the hall was open. I won’t say I didn’t see anything interesting, and I had a large number of rewarding conversations with all sorts of companies, making the trip very worthwhile, but I will say I saw less that was new and exciting than ever before. This may be a result of the show’s constant growth that meant in 3 days I still did not manage to get to 3 1/2 major rooms of the show, putting my focus on cars as I usually do. My favourite part of the show, Eureka Park, even disappointed even though I gave it most of a day. The proportion of products which are poorly thought through is always high, but you search for gems that might someday change the world. I saw few Eureka moments. Several fields, such as Iot/Smarthome were growing and maturing, with lots more companies, but at the same time, very little in smart home moves beyond the “Oh, that sounds nice” into truly appealing and useful. I’ve had computer controlled lights for decades. They are handy, and I would rather have them than not have them, but they aren’t essentials the way my phone and a dozen apps within it are, things I can’t do without any more. There were, again, a ton of different LIDAR companies. What’s interesting about the LIDAR crowd is that they are almost all quite different, in many cases taking entirely different approaches to the technology — the output, the steering, the sensing, the band and even the core technology. I’ll have more coverage of that later. Of course these are not for consumers. Other press were equally unexcited — I saw far less coverage of the “hot new thing” in the media this year as the show opened and progressed. This was the year of mostly incremental improvements. Flying car style vehicles did generate excitement, but they were barely there. 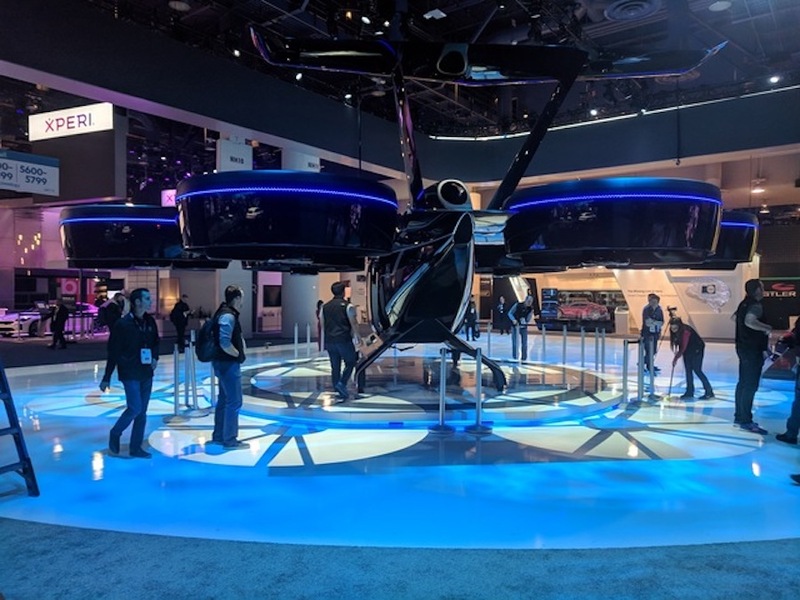 The most buzz was about Bell helicopter’s “Nexus” tilt-rotor hybrid vehicle on display. It’s a high-end vehicle, with 6 giant ducted fan tilt-rotors, and very much a prototype. Bell knows a lot about tilt-rotor from their work on the V-22 Osprey, a vehicle which has a rather checkered history, so it’s not sure how this will go. The few other companies doing flying vehicles (for people) had tiny booths showing nothing. The Nexus is a hybrid-hybrid — both multirotor and fixed-wing flight, and both electric batteries and gasoline powered generator for power. There was some interesting battery technology, including a small startup named GBatteries which claimed that by pulsing the charge voltage they could charge at vastly faster speeds — 5C, or 10 minutes from empty to 80%, and 5 minutes to 50%, without any more heat or battery damage than today’s fast charging (which takes about an hour.) Their demo was just on a drill, so it is yet to be proven in a car, but it would change some of the usability of battery devices and electric cars. I saw other interesting battery tech but there is some irony – because of all the investment made by Tesla and others in standard lithium ion cells, these cells are now better than other, more innovative technologies, because of their mass production (driving down the cost) and the heavy R&D (improving charge times and reducing battery degradation.) The lithium ion cell was created to be lightweight for laptops where weight is absolutely crucial, but now it’s everywhere, from cars to scooters to even grid storage. There was an uptick of mobility products (or at least I am paying the most attention to them) beyond cars, including scooters, delivery, bike riding and more.